myself still totally conflicted. 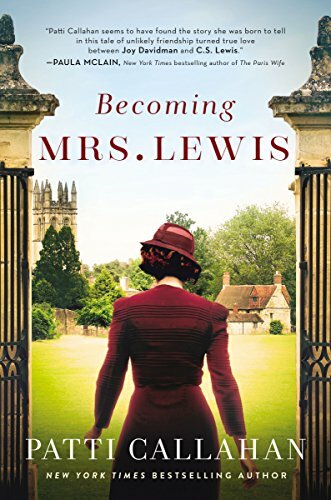 I would like to know how much in Becoming Mrs. Lewis is fictionalized and what the author actually got from all the papers that she read, as she readily admits that all letters between C. S. Lewis (Jack) and Joy Davidman have been destroyed. While she had access to Joy’s love sonnets to Jack, all the letters between them in the book are fiction. While we know that Joy greatly influenced several of Lewis’ works, including Til We Have Faces, Surprised by Joy (not about Joy Davidman, but about Jack’s journey to salvation), Reflections on the Psalms, and A Grief Observed, we know precious little about her. Joy’s morals are left pretty ambiguous and much of her behavior in this book does not do her credit although there seems to be redemption of a sort at the end, and that’s why I’d like to know how much is actually true. Is she a Jezebel, who pulled the wool over Jack’s eyes while never truly changing, or is she a Rahab, who had a sordid past, but changed her life completely, rescuing the spies and eventually being included in the lineage of Christ? While Joy does have an epiphany that her behavior will not earn her love, it is so close to the end of the book and her life, that it’s almost an afterthought. Some of this is spoilers if you know nothing about Joy Davidman, never watched Shadowlands, etc., although I gather much is pretty public knowledge. Joy is portrayed as an ex-Jew, ex-communist who had an affair with a married man, married him directly after his divorce, had a conversion experience, started writing to Lewis, then abandoned her children for several months with that man who was an abusive husband and terrified her children to go to England and rest. During her time in England, still married, she thought constantly about Jack, chased him wondering what his touch and kisses would be like, etc., had affairs with other men while chasing Jack, and when her divorce was final and she got her boys from America, she immediately sent them to boarding school. All through the book, Joy admits she manipulates men and others, trying to force people to love her. Her epiphany at the end is that God loves her, so she is loved, and she doesn’t need to manipulate and pressure people into loving her. And yet, this whole book has come across that she has had no loyalty to any man in her life or her children, no compunction about cheating with whoever is convenient, and through her conversations, comes across as unlikeable, narcissistic, and not much of a wife or mother. She also seems to have pressed Jack through all the time that he carefully kept her at arm’s reach with a love of a friend, not allowing their relationship to change to romantic. He only agrees to marry her when she is about to be deported back to America. This book leaves more unanswered than it answers, from Joy’s actions to Jacks’ reactions, and the whole thing with Jack’s friends, including Tolkien and others. Did they judge Joy because they could see what she was like or did they have a prejudice against Americans? In addition, I wish it were more clear whether Joy’s rejected works were not published because they weren’t good or because she was a woman. Now I am left wondering if that is all there is. But while I think the first 70% of Becoming Mrs. Lewis is pretty heavy and slow, partially due to the exchange of letters which intrude abruptly into the text, it does speed up at the end. And while I found myself haring off to read other books several times while working my way through this tome of 400+ pages, I did finish it, which is at least something since I’m not adverse to DNFing books that are a total waste of time. And now I am intrigued and must watch Shadowlands. (Or perhaps I should not dig deeper into the wound this book has left. But where can I find out more about Joy and Jack at this time in their lives? Must I always consider her as an unlikeable person chasing an older man with yellowed teeth and ratty clothes? Is it all so cerebral that I am missing the point? Their conversations are littered with quotes, but having had many such quote-dense conversations with my grandmother, I can relate to the joy of shared reading, shared quotes, shared mindsets. Somehow Joy’s actions never seem to match her words or proclaimed Christianity. While she admits that she fails God again and again, there’s something lacking in her sincerity. I just didn’t like Joy or have any sympathy for her problems, except her health problems. Those felt real, ignored by male doctors, and an impending death sentence. Overall, I had way more sympathy for Jack. Here I am, writing this review and still conflicted. Am I letting my dislike of Joy’s actions color how I feel about Becoming Mrs. Lewis? I think the book could have benefited from a judicial pruning, but then again it brings across the weight of seven years of illness and hidden cancer eating at Joy’s health. I judge this an above-average book that in many ways raises more questions than it answers. Recommended for fans of Joy Davidman or C.S. Lewis with the caveat that what you read may affect your respect for them.